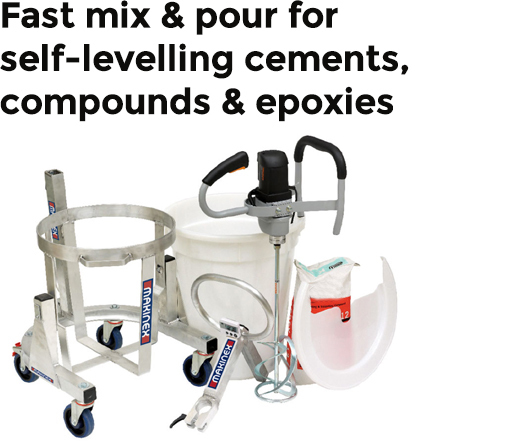 The Makinex Mixing Station MS-100 is the ultimate mixing solution for self- levelling cements, compounds and epoxies, producing a perfect mix every time. Designed by Contractors for Contractors, this portable station provides efficient hands-free mixing and enables fast precision pouring of materials. Get your job done in half the time! 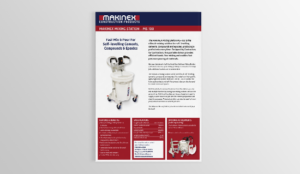 The Makinex Mixing Station with stirrer can mix up to 100kg (220lbs) batches in 3 minutes. For large jobs (larger than 80m² or 861ft²) additional stations are recommended. The Makinex Mixing Station is ultra-lightweight and the ergonomic design with easy tilt operation provides control and speed for precision pouring. It also features a dust/splash reduction cover for safer use and less mess. The station is suitable for various Stirrers/Mixers including the Protool® Stirrer MXP1602E and Collomix XO6® Hand Mixer, Stirrers/Mixers are optional and sold separately. (Please contact your retailer for more information on other suitable models). The Makinex Mixing Station provides excellent value and pays for itself quickly – saving time on jobs and labour costs. I’ve used the Mixing Station to install TRU, Ardex, Stampcrete,MiraCote, FossilCrete, Mapei and pretty much everything else I use for decorative concrete. I initially purchased the MS-100 to do a polished TRU job which was 3000 sqf. I was left in a bind. I coordinated 6 men for two days to get it poured. I quickly found out in a couple of hours that the entire project was going to be done in about 5 hours or so and I really only needed 2 helpers and myself. We were able to mix 3 bags every 5 minutes with consistency right out of the box. Wall studs were up, sliding doors and floor drains installed, conduit every where. Didn’t matter. We just mixed and poured exactly where we needed to be with virtually no clean up! Thanks to the MS-100, total job time from prep to clean up has been reduced by 25%. M-Tools is the european distributor of the Makinex products. To see a detailed list of our products please see our product page.